Bring in the Best: What has become of JN201 today? What has become of JN201 today? 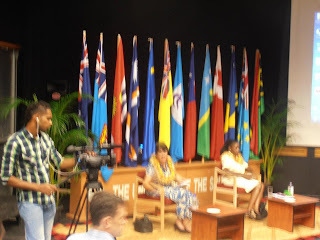 JN201 is a course here at the University of the South Pacific called Print and Online. This course is unlike any other because there are so many changes that are being made during the duration of the course that students become so confused over it. 90% of this course goes to Print and the other 10% is allocated to Online which is pretty stupid considering that one of the major theories is that online media will in the future overtake print and broadcast. It should be at least 50-50. The teaching assistant for this course is in charge of the Wansolwara, the student newspaper. Every other year , all editors, chief of staff and what not are democratically elected by the students. Years back former students say that students who wanted an editorial position had to apply in a letter to obtain a position. However, this year the teaching assistant without consulting the students made the decision on her own. For the first issue a third year student had been appointed as editor. A few students had grievances over this and a particular student Arnold Chanel had come to me with his complaint saying that they were going to write to the media mainstream, including the fact that the teaching assistant did not have the right credentials to be teaching this course here in the university. Here at the University of the South Pacific , students are supposed to be receiving the best according to its strategic plan. For photographs, students were taught the theory part by Dr. Ian Weber. Only a few students were again appointed by the teaching assistant to be photographers and so as a result many student journalists in USP do not know how to operate a professional camera. How can we as future journalism graduates go into workplaces and say proudly that we are from USP, only for employers to find out how unskilled we are with professional cameras? Sure the theory part was good, practical wise, not so much. All students should be allowed to use the cameras and take their own pictures. It is after all school property. Two issues of the Wansolwara had been published. For the third one, some of the same students that were used from the second issue are being used again as editors, sub-editors, and what not. USP Journalism also has a few international students here for a semester. They have not been given a role yet. Does nepotism play a part here? There is a student from New Zealand and one from the United States of America. If we are to be fair, why not give them a role in the newspaper? I am sure, they have plenty to offer us. Sharing their knowledge with us Pacific islanders would be very welcomed. Strategic plan for 2012, 5.12 it mentions " Enhancing student support for international students". 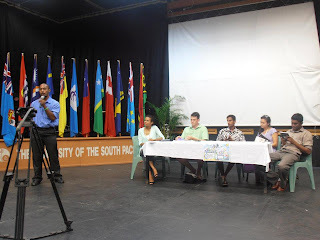 Again there are many other students from other Pacific Island nations like Tuvalu, Solomons, etc, yet all one sees are Fijian students running the school paper. Nepotism or something a bit more racial?? I am of course just thinking out loud. Now, for most courses, students are given the course outlines and assessments. Marks are given straight after marking so that students can know whether they are doing good, or bad, so that they can aim to do better. With JN201, you ask how you are doing, the teaching assistant does not say how well or how bad you are doing. She only mentions that most of the students are failing the course already. How are students supposed to know whether they need to work harder or relax for a bit if we are not given our assessments so far? How does this fit into the strategic plan of 2012 in terms of Student Support. Most students have grievances over this, but none will speak out. Some would like to complain to the school, but do not quite know how to go about it. A few weeks ago, 201 students had to stay back in school to correct spellings, check grammars of the stories brought in for the second issue. This was told to us by the teaching assistant. A friend of mine from Tuvalu did not want to go home alone because she feared going at home alone at night, even in a cab. Around 2am in the morning we left together, in the same cab. I dropped her off first then went to town to catch the minibus, since i live in the next town. For your information, drunks came in the minibus. It was a little annoying and scary to be near so many of them and to be a girl traveling home alone. So i ask the question, if any of the students safety had been compromised that night, who do we take to task? The university or the teaching assistant for the issue of negligence? Again this does not go with the strategic plan objective 5 whereby the University of the South Pacific aims "To improve student and academic support services to ensure student safety, security and well-being and improved student success". For deadlines all courses have deadlines for their assignments. If you submit in your assignment in a day late, marks are deducted. In this course, you submit in your assignment late you automatically get a zero. Can the Faculty of Arts and Law have a discussion about this and let students know what the marking criteria lis like for JN201 course and for late submissions? Not make the rule as we go. "No it does not get a zero.. I am only concerned with you submitting in your work assessments. For late assignments, it is going to be marked, but marks will be deducted". For the last issue of Wansolwara, i had raised my hand to be in the sports team to cover the Cokes. Somehow i was called to the teaching assistant's office to be told that i was not going to be in the sports team on the day the games were underway. Kasim Nazeem a fellow student had brought us free media passes and we had been covering a few stories down at the grounds. Upon coming back to school for a break, she calls me to her office to let me know that i was not going back to the grounds as part of the Wansolwara team. I just went out, gave up and gave my free media pass for that day and the next to a friend. Because of this i do not bother attending editorial meeting. What is the point? Was i being pushed aside because i was a girl? An assignment popped up two weeks ago. 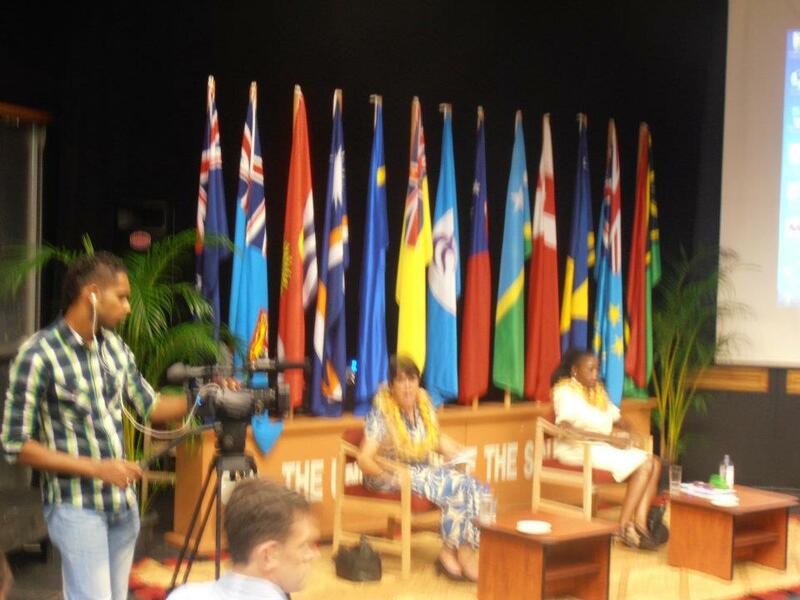 Most of us found out on the Friday night of World press Freedom Day that an assignment is due the next day at 6am in the morning, a newsworthy story of Richard Naidu's speech. Assignments given last minute and changes to our course assessments like now we have to do presentations replacing another assessment is really hectic to our mode of study. I am probably going to fail this course (well the print part only), but i will not care so much because i will know that i got failed by someone who did not even have the right credentials in the first place. Many students would like to complain but are just do not know the right place to go and some are just fearful. "The only thing necessary for evil to prevail is for good men to do nothing" is a quote by someone, but in this case "The only thing necessary for bad education to to prevail is for students to do nothing". If we as students can not voice our issues for fear of failing, then we are not worthy to take up this profession. There are many more issues from many students but i have to stop here because i think i may have exceeded my word count. However i do finish with this question. So many students have failed the course both from last year and this year, the same is occurring. Is it because of us as students or is it because of the teaching skills offered right now in the Print section? ?